It's reader request week! 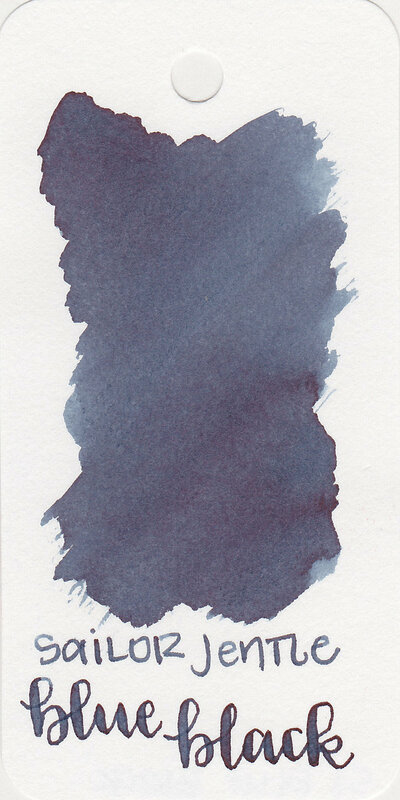 Today's reader request is Sailor Jentle Blue Black, which can be easily confused with Sailor Jentle Sei-boku, which is the pigmented blue black. Sailor Jentle Blue Black is pretty affordable at around $12 for 50ml. Thanks to Pen Chalet for sending a sample over for review. Blue Black is a lovely blue black, with just a touch of grey in it. In large swabs the ink appears much darker, with a coppery red sheen. Water resistance: Medium-some of the ink washed away, but you might still be able to read what it said. On Staples 24 lb copy paper there was feathering and bleeding in the larger nib sizes, M, B and Flex. Ink swabs for comparison, left to right (top to bottom for mobile RSS): Lamy Blue-Black, Sailor Jentle Blue Black, and Sailor Sei-boku. Click here to see the Sailor inks together. Monteverde Azure Noir, Nemosine Pleiades Blue/Black, and Aurora Blue Black. Click here to see the blue black inks together. I used a medium Pilot Vanishing Point Galaxy on an ivory Hippo Noto Notebook. The ink had a wet flow. I love the flow of sailor inks. Overall, it's a great basic blue black, has a nice wet flow and is pretty affordable too.